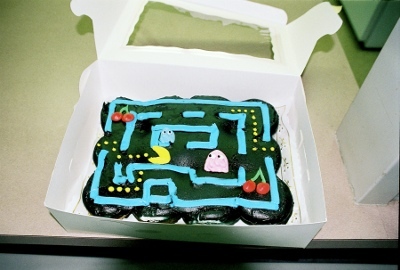 Pac-Man cupcake cake from Cupcake Cravings in Sacramento, and the pixel cookies baked by Bill and Tracia. 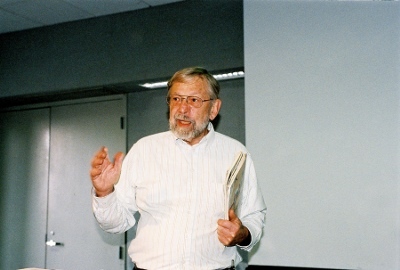 Bob with his 130XE and 1200XLs. An extra 2600 arrives. 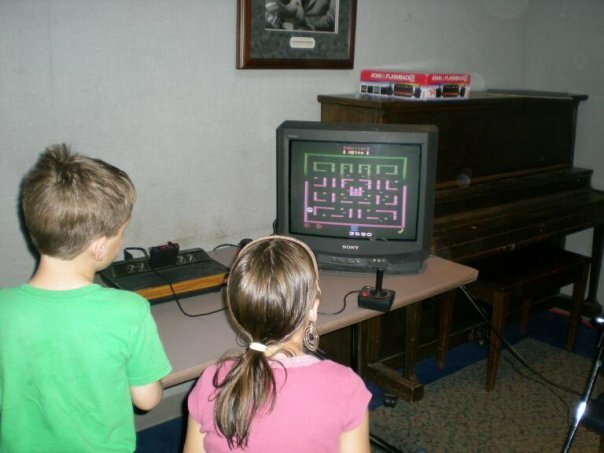 We eventually found a TV for it. Paul Cubbage sets out some APX catalogs for people to look at. 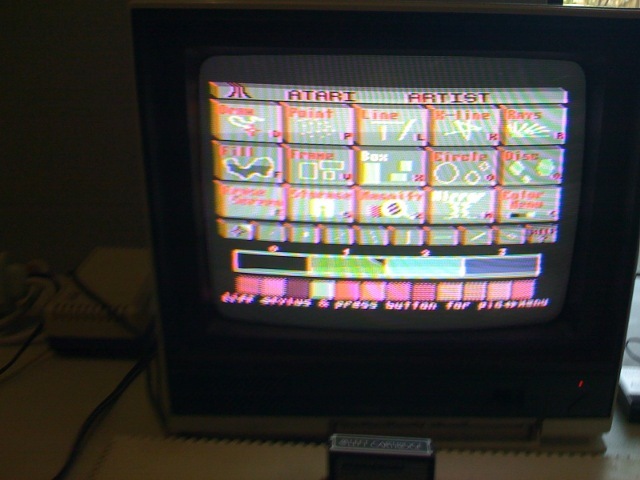 My (Bill Kendrick) educational displays: 'how sprites work', 'how road effects (like Pole Position) work', and simple BASIC bouncing ball program. Majority of folks sit down to listen to Paul. 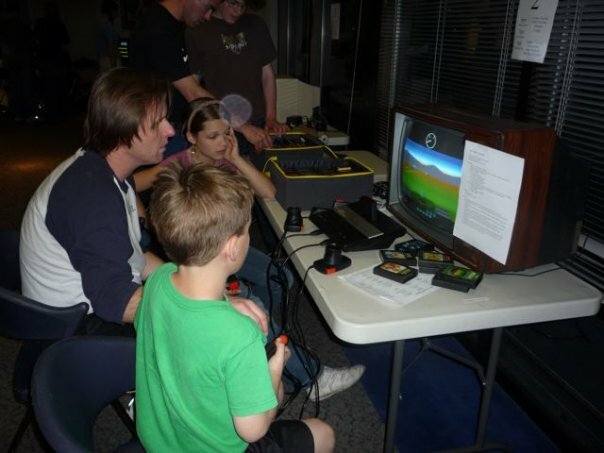 A family enjoys some Combat. 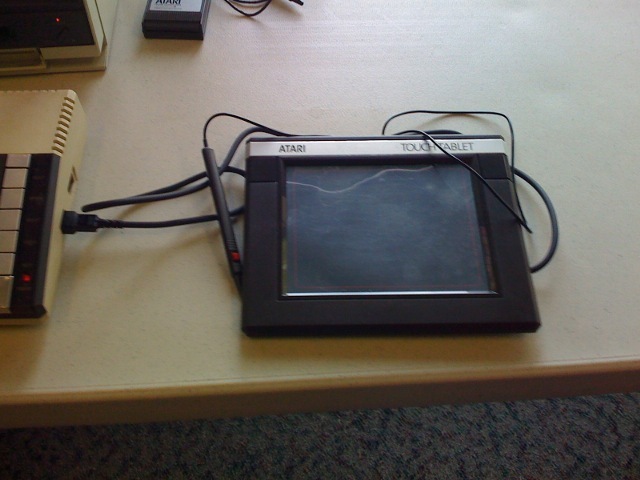 AtariGraphics and the Touch Tablet on another 800XL. 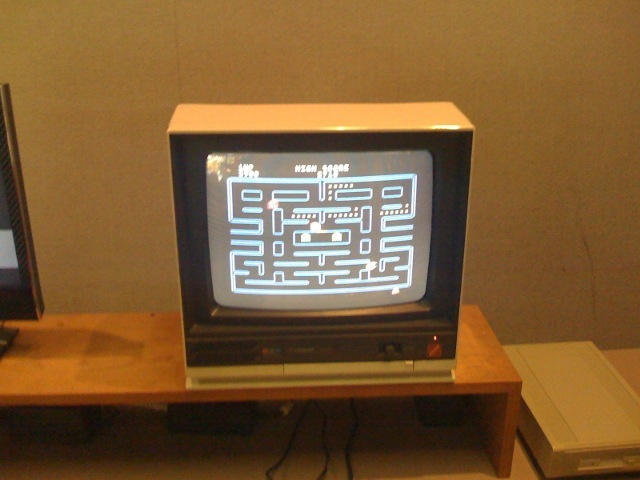 Playing Pong on the "TV Paddle Games" device. 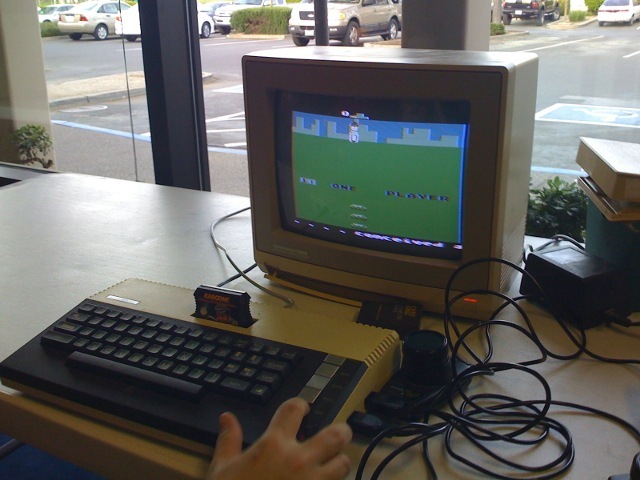 Playing a homebrew game on the 2600. 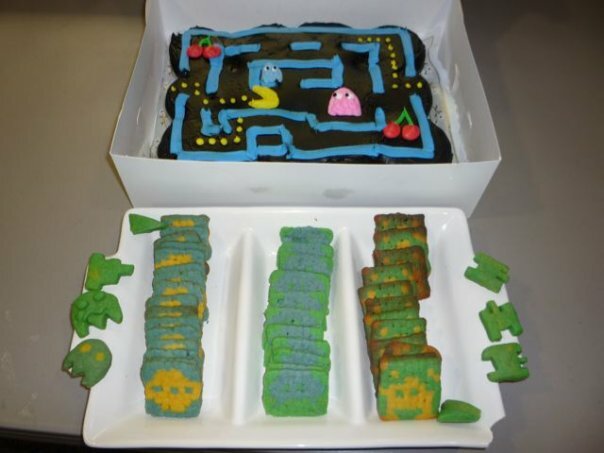 The last of the small batch of pixel cookies. 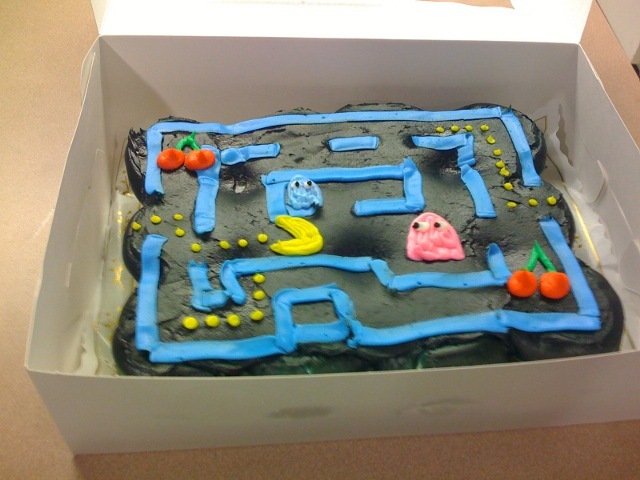 Playing some Millipede and Pac-Man on Bob's 8-bits. Jason's Lynx and 2600 (which also eventually get a TV) arrive. 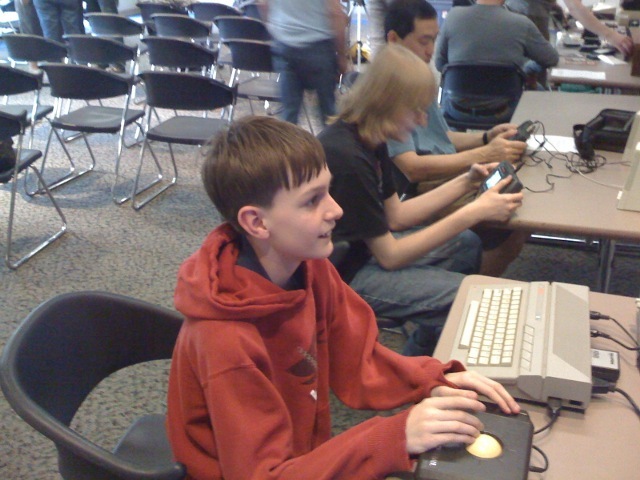 Three kids played Dandy on the Atari 800... a lot! 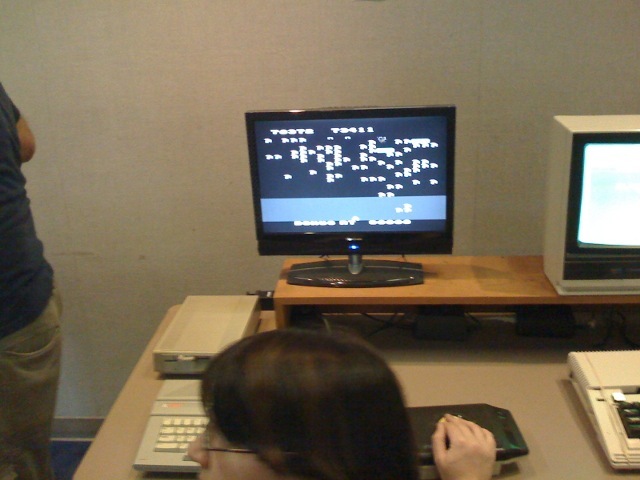 Bill Kendrick's SIO2SD booting Dandy onto the Atari 800. 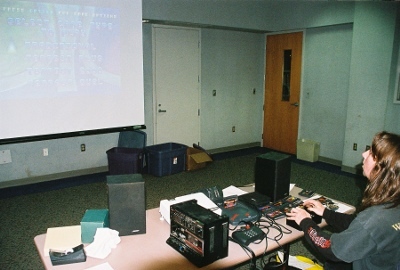 Tempest 2000 on the Jaguar, up on the projection screen. You have to watch that grue. 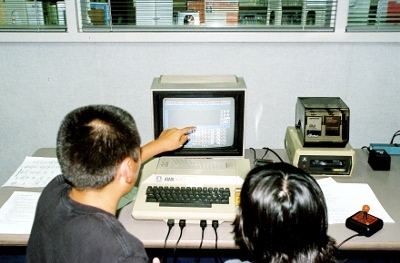 Zork's being loaded off of CompactFlash card on one of Bob's hacked 1200XLs. Inside another of Bob's 1200XLs. 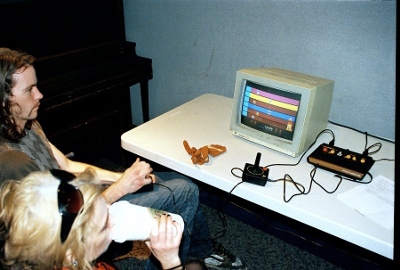 Atari fanatic playing Zach's "Four-Play." 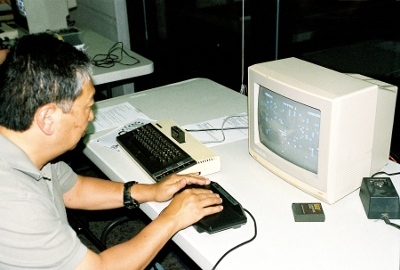 Barbieris enjoy some Battlezone on the 2600. Warlords, though in need of three more players. Nice new LCD. 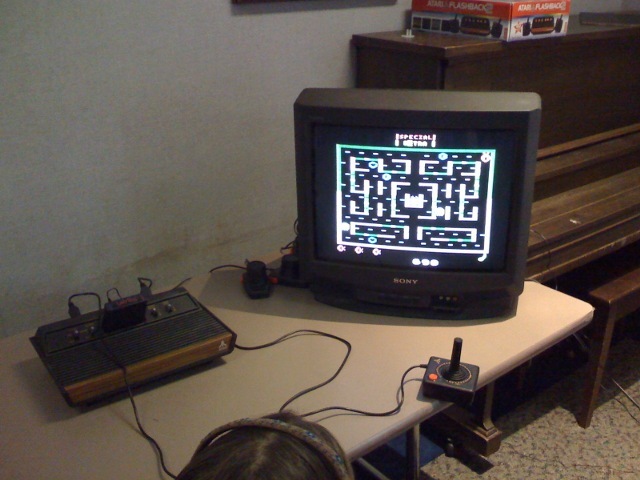 Nice old 2600. Milling about, watching and playing games! 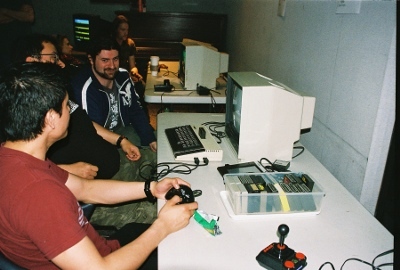 Zach's 2600 and a homebrew game(?). 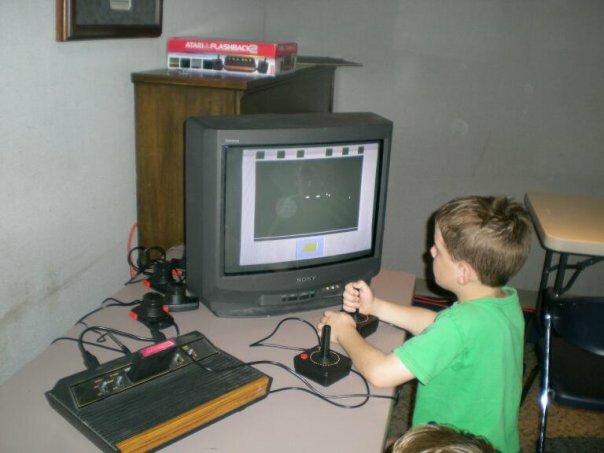 Adventure on the Atari Flashback 2. 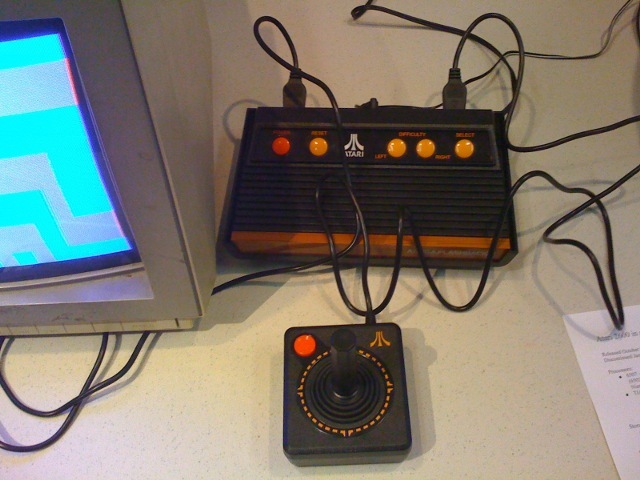 Atari Flashback 2 and a joystick. 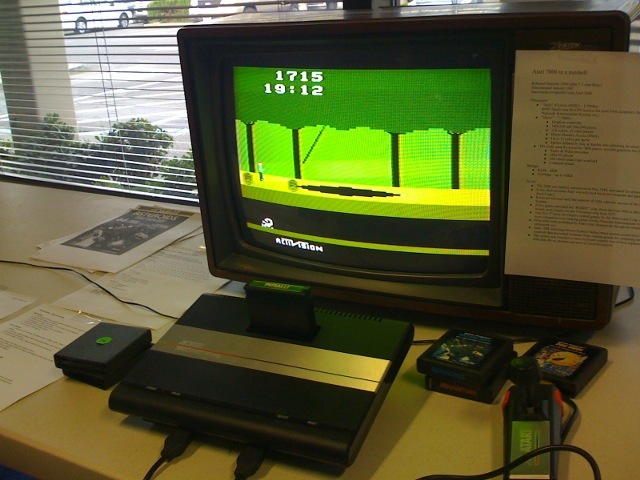 Pitfall! 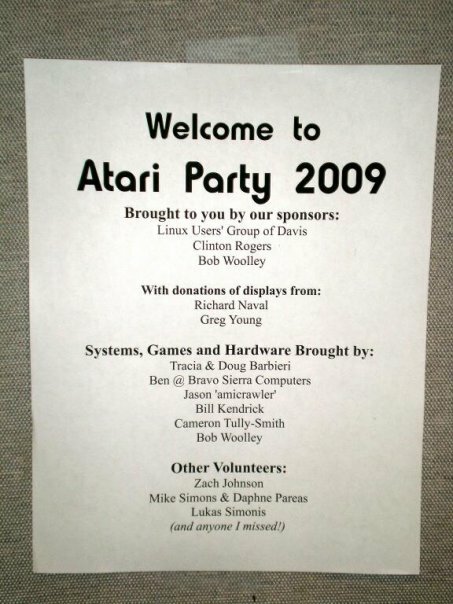 on the Atari 7800. 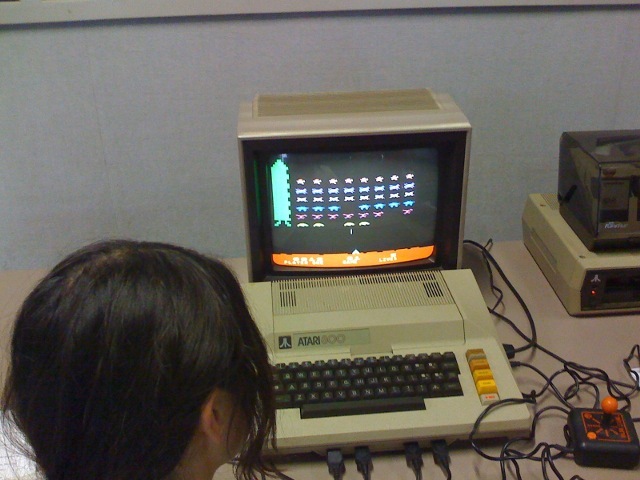 Space Invaders on the Atari 800. Lynx. We had three, and ComLynx cables. Enjoying some Millipede on the 130XE (foreground) and Lynx games (background). Mario Bros. ends up on the big projection screen. 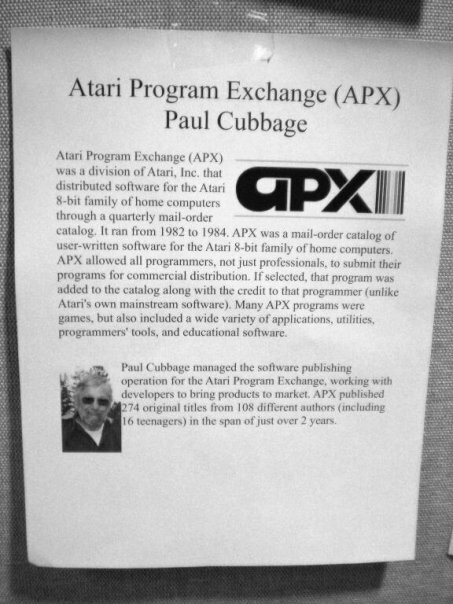 Description of Paul Cubbage's talk on Atari Program Exchange (APX). 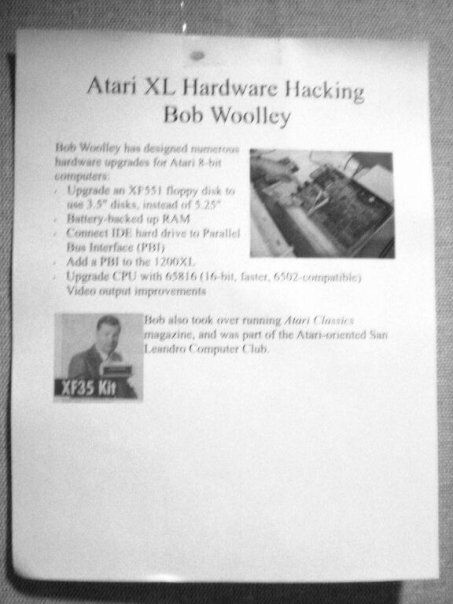 Description of Bob Woolley's talk on XL hardware hacking (which didn't happen, but he had his systems there). 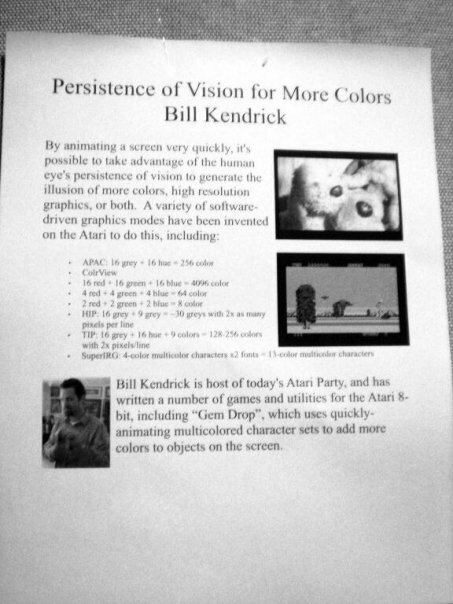 Description of Bill Kendrick's talk on persistence of vision tricks to get more colors (APAC, ColorView, HIP, TIP and SuperIRG). 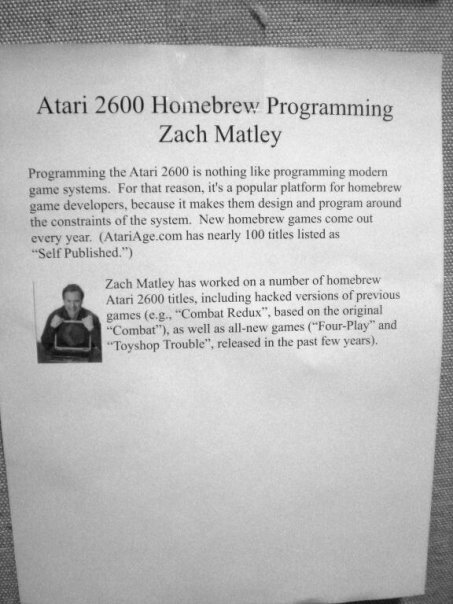 Description of Zach Matley's talk on homebrew Atari 2600 programming (which also didn't happen. 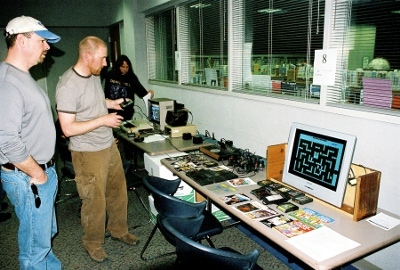 but he had his system and games there). 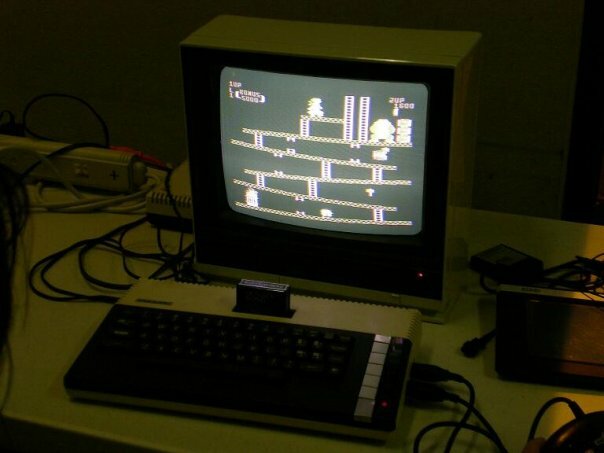 Donkey Kong on the Atari 800XL. 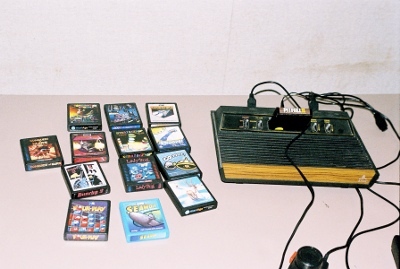 Zach Matley's Atari 2600 and homebrew games. 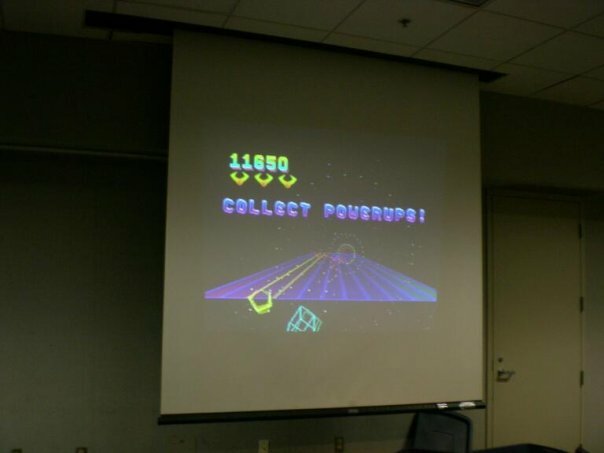 Star Fire on the Atari 2600 (homebrew creation based on an old arcade game). 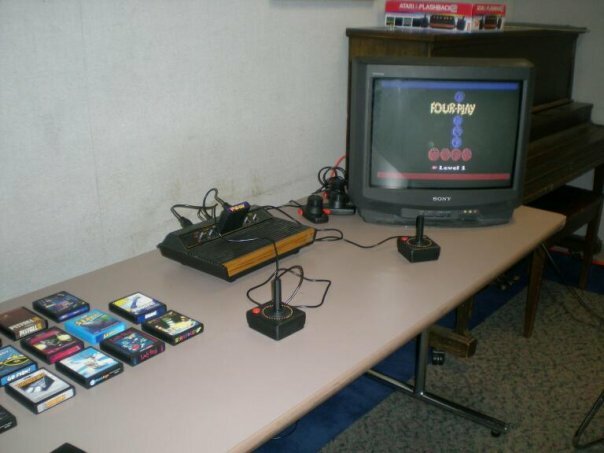 Lady Bug on the Atari 2600 (another homebrew based on an arcade game). 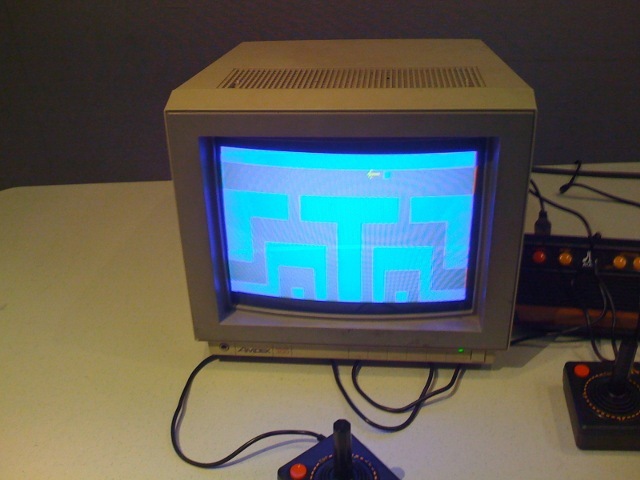 Four-Play on the Atari 2600 (a homebrew game by Zach Matley).